Thirty-Two three-bedroom climate resilient apartments will be constructed in Bellevue Rawle in the Roseau North Constituency as part of the government’s plan to build 5000 homes across the island. A release from the Office of the Prime Minister says the Government has once again partnered with Montreal Management Consultancies (MMCE) to undergo this housing initiative. During a site visit on Wednesday April 10th 2019, Minister for the Environment, Climate Resilience, Disaster Management and Urban Renewal, Hon. Joseph Isaac said, this is in keeping with his promise to work on behalf of Roseau North and Central constituencies and that it was the housing component of the urban renewal initiative. Expressing satisfaction with the work that has been done thus far by MMCE, Isaac said he was working relentlessly to guarantee housing needs were met in the arear. 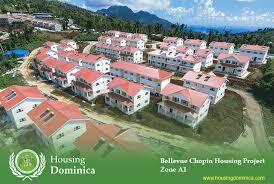 He revealed that additional apartments will also be constructed in the Roseau Central Constituency.